Our signature coffee blended with sweet pumpkin flavor, sprinkled with a delicate mixture of spices to create a treat for any season. We are from California and faithfull Peet’s Coffee fans, but when touring New England last month we stayed at a Bed and Breakfast Inn in CT and had the opportunity to try New England Coffee’s Pumpkin Spice at the Inn. We fell in love with this coffee. Once we returned home I ordered 3 packages of this coffee and now have ordered another 6 packages to give our CA friends and family New England coffees – anxious to try the Mocha Mint! Wonderful coffee!!! This in my opinion is one of the better pumpkin spice flavored coffee’s that I have had. 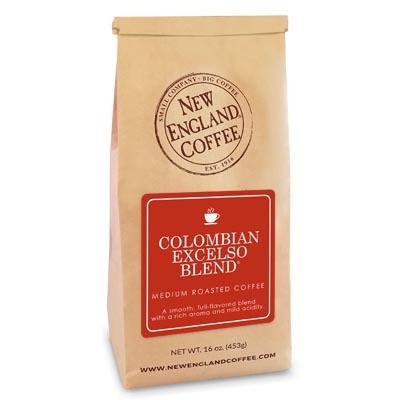 I have ordered this from New England Coffee several times in the past, and have been pleased with every bag. I first experienced pumpkin spice coffee at a little coffee cart on a crisp fall day and I was hooked. I have since ordered the whole beans in 5 lb bags and never been disappointed with the smooth mellow blend. The first time I tried the new England pumpkin spice coffee was around 2 years ago. I happen to come across it as a little mom n pop grocery store in my area. Sadly they never had it again, then I was lucky….my mom happen to find it at here grocery store and sent me a few packages….LOVE the stuff! And finally dawned on meach I can order it online…..5 lb bag….come to mama! Pumpkin is my favorite flavor and I enjoy it year round. This is my very favorite pumpkin spice coffee, bar none. This is my “favorite” coffee flavor year round!!! 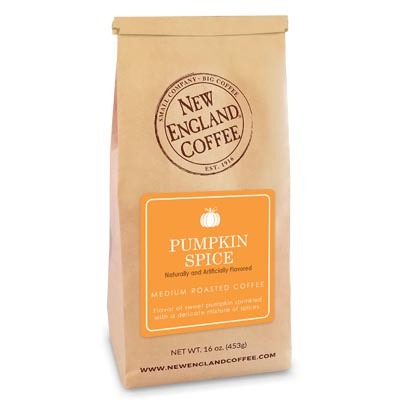 I just wish that New England Coffee offered their Pumpkin Spice in a decaffeinated version!!! Just returned from 2 months in So. America and am doing my New England Coffee order this a.m. to have my fresh Pumpkin Spice coffee delivered to my door here in California!! !